Facebook has officially announced Facebook Places for the UK enabling you to post location-specific information to Facebook. 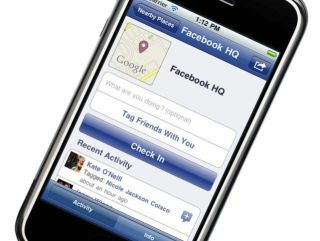 The link is now live in the iPhone app and you can also access Places on other handsets through touch.facebook.com. Be warned that by using Places your location will automatically be posted to your wall for all to see - there is no pre-warning about this specifically though there is a more general warning. However, to be fair to Facebook, Places is opt in, so you only check in if you have authorised it. You do also get a warning if you define a new Place as you'll see. So let's get started. Your iPhone app will highlight that Places is now available - if it's the latest version of the app of course. Click on the Places icon to see a list of your friends' locations. The eagle-eyed among you will note that this image is taken a lot later than all the others. That's because, when we first tried Places at 8.30 this morning, none of our friends were using it. This has now changed! This is what you'll see if you can't connect to the internet (good work, Vodafone). However, if you have some semblance of connectivity, a list of local businesses will then appear. You can click the + icon to add a new one - we'll show you this screen shortly. So we've decided that we're at a place called The Corridor (a shopping arcade). As you can see, you can say what you're doing there as well as tag other people in your status update. Using the options menu in the top right you can also flag inaccuracies in the location data. Clicking the Check in button will take you to this screen where you have to agree to use Facebook Places. THIS IS THE ONLY PRIVACY WARNING before sharing your location, so take heed. Facebook says that "check-ins are defaulted to friends only (unless your master setting is everyone) and minors will not appear in posts or check-ins to anyone but friends, you can also always remove any check-in from your phone or on the web." "Users have full privacy control and can customise these settings as well as amend them from a mobile device." If you chose to add a new place on the first Places menu screen, this is what you'll see. Define the type of place it is, click Add, and you'll see a warning about making places public as well. When you check in, your location is shown in your News Feed, and it will show up in the Recent Activity section on the page for that place. Facebook says that if you prefer not to appear in the 'People Here Now' section on a place page after you check in, you can uncheck the appropriate box in your privacy settings. Facebook has obviously built some pretty robust privacy settings around this, but from our first look at Places it's still confusing as to what you need to configure and what's best to choose. The verdict is decidedly 'use with caution'. As far as the actual service goes, we think Facebook's first foray into location-aware has success written all over it. Why? Because, providing you're willing to share your data, the whole thing is so easy. Using Foursquare or Google Latitude? You won't be for long.